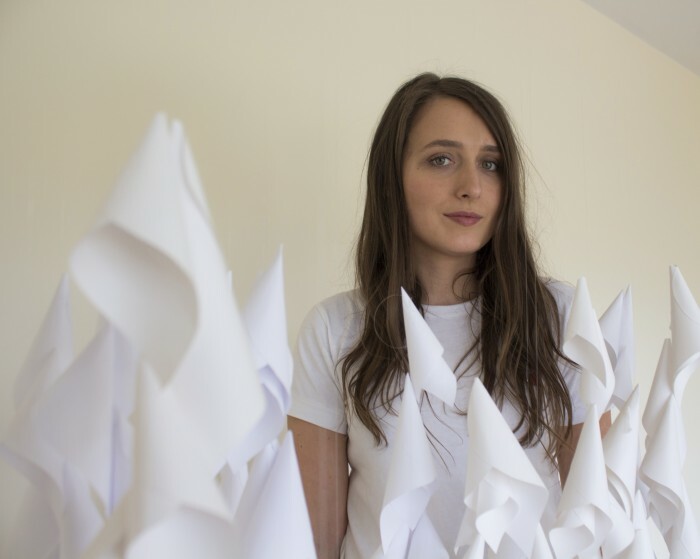 “Beautiful, breathtaking and inspiring” are just some of the words used to describe the recently launched Paper Bloom exhibition by artist in residence Katie Moore, in conjunction with The Jackie Clarke Collection and Mayo County Council Arts Office and Library Service. ‘Paper Bloom’ is an exhibition commemorating the 1916 Rising, incorporating the unique, nationally significant resource that the Jackie Clarke Collection represents, especially in the centenary year of the Rising. Inspired by the paper peace lilies that were found in Jackie Clarke’s wallet, and the feeling of being overwhelmed that comes with war, Katie – the Jackie Clarke Collection’s artist-in-residence – decided to create an installation. Paper Bloom, the resulting installation structure is based on the measurements of Padraig Pearse’s jail cell at Kilmainham Gaol Dublin. The structure is covered in 5,500 peace lilies, handmade from fabric. Describing her exhibition, Katie explains: “The lilies in Paper Bloom are white; I wanted it to be peaceful as it is war that we are thinking about. The amount of peace lilies is overwhelming, suggesting how one would feel when in war; uncomfortable. But at the same time the overwhelming feeling could signify the vast amount in the Jackie Clarke collection, having being described as ‘an overflowing treasure chest’. It was important to me to make a piece of art that is an acknowledgement to the great collector Jackie Clarke and an act of memory for the 1916 Easter Rising”. 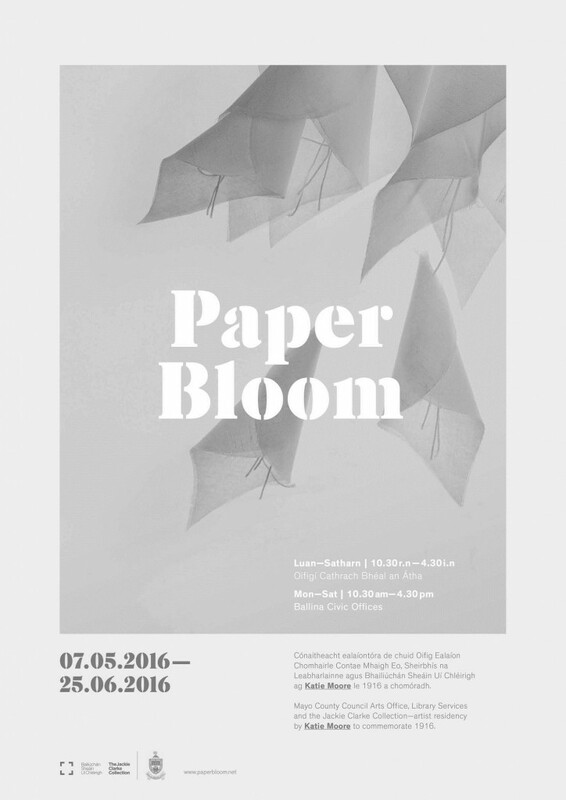 Paper Bloom is on exhibit at the Ballina Civic Offices Exhibition Space (beside Dunnes Stores, across from the Moy Club) until the 25th June. Opening hours: Monday to Saturday 10.30 to 4.30. Free admission and all are welcome. .